The first National Stakeholder Workshop within the project “Assessing Territorial Attractiveness in SEE” was held on 28 March 2014 in Skopje, attended by 23 representatives of relevant institutions such as the Ministry of Environment and Spatial Planning, Bureau for Regional Development, Spatial Planning Agency, Agency for Real Estate Cadastre, municipalities, ZELS, Institute of Geography, Cultural Heritage Protection Office, Ministry of Local Self-government, UNDP and local CSOs. The aim of the project “Assessing Territorial Attractiveness in SEE” is to establish a framework concept as well as tools useful for policy makers to enhance the quality of development decisions. The results of the project are to be used by policy/decision makers in improving their cooperation and networking at the South East Europe scale, in view to reinforce the role of territorial knowledge in promoting cohesion and growth in South East Europe. Besides a common concept of territorial monitoring that will be established within the project, a policy coordination process of relevant stakeholders will be designed as well. It will enable promoting, supporting and actively moderating participation and involvement of policy and decision makers from different sectors and administrative levels. Concrete outputs as Common territorial monitoring framework, Transnational as well as National/regional territorial quality and attractiveness reports, Policy coordination process handbook and workshops will enable to create and/or strengthen permanent stakeholder networks coordinating different policies' goals, objectives and implementation measures. Within the project, policy coordination is seen as a permanent and continuous process. 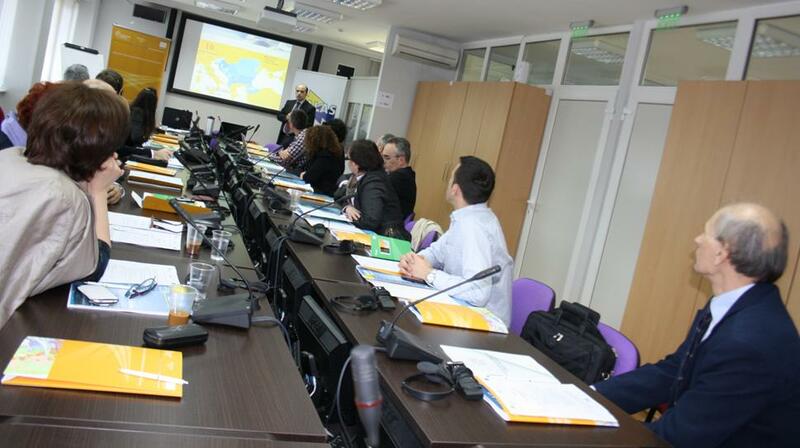 Therefore, series of national stakeholder workshops are organized in each of the project countries. The participants of the first workshop learned about the project’s goals, its achievements as well as the concept of territorial attractiveness, which were presented by the Project Manager Mr. Blaz Barboric from the Geodetic Institute of Slovenia. In addition, the Stakeholder Involvement Plan and current status of the territorial monitoring system in the Republic of Macedonia were presented by the National Consultant, Mrs. Danica Pavlovska. Presentation was also made by Mrs. Sonja Dimova - the State Advisor at the Real Estate Cadastre Agency on the establishment of the “National Infrastructure on Spatial Data of the Republic of Macedonia”.